I’ve been back in Puna for a little over a week … a few days into the surreal return and I was wondering … had I ever really left? The time continuum gets pretty wonky sometimes and this returning after a long time gone certainly calls it forth. I’ve experienced it before, a time when I went traveling for close to two years over a decade ago. When I returned to Petaluma, there was something eerily familiar and yet so odd about it all – everything was where I had left it, the town, the stores, the roads and the restaurants. Ohsure, there were some additions and some that had up and disappeared, but for the most part, all looked very well known and normal. Even my friends were still there to greet me and welcome me home. At that time, it indeed had been home. Returning here to Puna, I wasn’t so sure; or if I was leaning into any kind of sureness, it was that it wasn’t home anymore. I felt that I was likely done with Puna. I hadn’t missed it, I hadn’t thought much about it; I was gone into a new, rich and full life of other experiences and imaginings. But then I landed. And like Petaluma all those years ago, the surreal-ness surfaced once again. 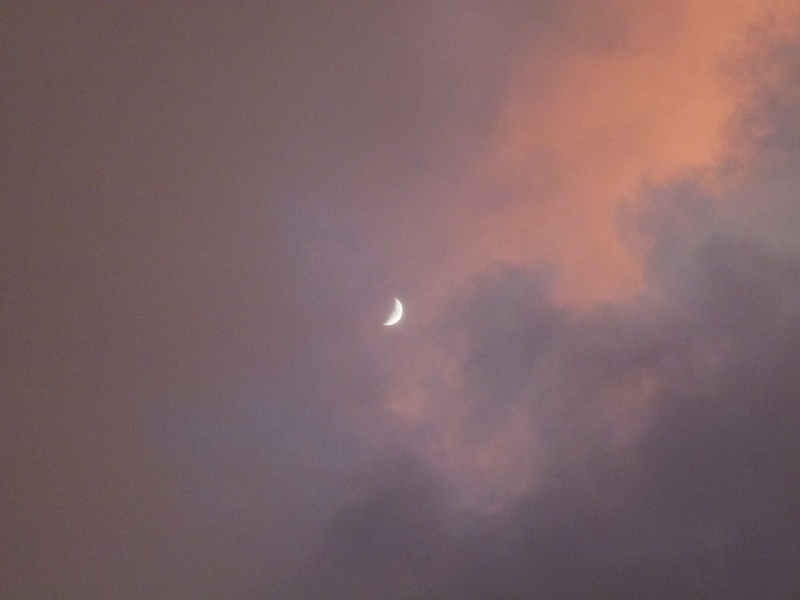 As we drove from Hilo into Puna, it felt (even more than it ordinarily does) otherworldly. That same familiarity and yet some distance from it, too. We went directly to Kaleo’s in Pahoa, one of my favorite island restaurants, and then it started getting really weird. The same menu, the same servers; even some patrons I recognized and a couple of men from my social circle with whom I enjoyed a lovely “Welcome Home!” But it was strange – people know me here, I know them. It all looks more than vaguely familiar. I seem to be connected here. This may sound odd, I know. I’m just not sure how to describe this feeling. While I don’t think it’s totally self-centered in its derivation, I know, it has the sound of that: “Since I’m not thinking about you and since I’ve left you, I forget that you even exist anymore and then when I return and find that everything is carrying on just as it was before I left, there’s something shocking about that.” I don’t think it’s quite as narcissistic as that sounds, but it does ring true for me. From the restaurant, we went to pick up my car. My car?! Oh, that’s right, I have a car! I wonder where the keys are. Oh, David’s got them, great! Ohyeah, David and Howard. I remember them, my friends David and Howard. I bid my goodbyes and head … home. Home? Yes, home. I drive down the Red Road toward Kapoho and as I scan for my turn off, I remember how hard it is to find in the dark and proceed to drive right past it. I turn around and the rough, dirt road looks simultaneously familiar and like one I’ve never driven on before. Because it’s dark, I can’t see the lush overgrowth of palms and tropical flowers and foliage that line this dirt path, but I remember they’re there; I remember the sense of ‘Old Hawaii’ I have felt when I’ve driven this road before. Yes, suddenly it too has a familiarity to it. I carry on, and while it feels longer than I recall, I soon arrive at the door to my sweet cabin. It’s still here. If there is one thing I missed in my almost-year away, it was this place, this cabin and these kitties with whom I created home. I walk both tentatively and eagerly up the five wooden steps. And I step inside. It looks way more than familiar. All my things are around – my books, my photos, my bamboo and teak furniture, it’s all here – and Carrie, the kitty sitter, has left me a glass of Chianti as a welcome. Piles and piles of 10 months worth of mail await and everything else appears as if through a thin veil – I move slowly with bewildered curiosity through this place, this building, this cabin … my home. Where are the kitties? 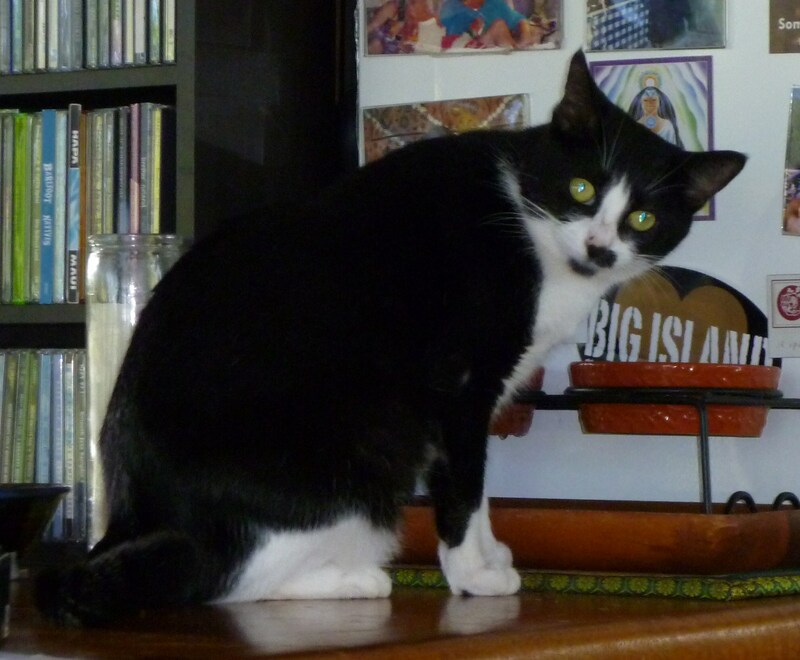 I’m painfully aware that the time has come to confront the disappearance of Pono, a fact I have chosen up to now, not to treat as such. I still have hopes that he’ll return. But even his sister Makana is nowhere around. I call and call, but she doesn’t come. I know this cat game and I know she’ll show up when she’s damn good and ready. Until then, I’ll keep calling and she’ll keep ignoring me until she’s decided it’s time. The coqui frogs are singing. The clear night sky is ablaze with stars. The trade winds are softly wafting through the screen cabin. And while my feet are not yet firmly planted on this ground, on this island, somehow, in some strange, unknowable and unexpected way, I feel like I’ve returned home. My first week back has been a combination of moving back into my cabin and reconnecting with the greater community here. My primary focus has been the cabin and re-inhabiting it as my own after being away longer than I had lived in it before I left. I’m especially focused because it was maintained in nothing close to the fashion that I choose to live. So I’ve been scrubbing, cleaning, scrubbing, cleaning and more scrubbing and more cleaning. It’s practically a rain forest, after all, and things get moldy and danky pretty quickly even when we keep up on them around here. And things grow like crazy. My garden area and outdoor shower were completely overgrown with 10 foot tall weeds and vines wrapped around every which way; so along with the scrubbing and cleaning came the pruning and cutting back. If someone’s not so inclined to keeps things in the kind of order and beauty that I prefer, well then, they get pretty gross. And gross is what I returned to. I tried, hard, not to focus on the annoyance factor around the truth of that and instead see it all as a process of reclaiming the space as how I want it to be for me. I’ve done that, mostly, and while I’ve exhausted myself, there’s also been a Zen-like quality to the process that’s felt grounding and solid beneath me. And then Makana strutted in. She didn’t look particularly interested in me, but she took note of a human here in the house; and she did seem to remember me and recognize my voice and my smell. What do we really know, anyway, about what animals know or remember; and how much of it is what we hope or want them to know or remember? In any case, I was delighted to see her and smothered her with hugs and kisses as she tried to squirm and squiggle away from me, no matter my insistence on delivering them. There really is something about the light here in Hawaii. There’s something about the air, too – it is loaded with way more oxygen than the air most people are breathing in everyday. That’s what they say about the air here in Hawaii and I have no reason to doubt it. Kapoho is especially known for having some of the cleanest air anywhere on the planet. And so indeed, the light and the air are simply different here. I saw it and felt it instantly on my first de-planing a few weeks ago on Oahu and I feel it still. There is simply something ineffable in the air here. And I saw it and felt it this very first morning as I awoke amidst the overflowing, surrounding tropical flora, the dawn light and the ocean crashing off in the distance. 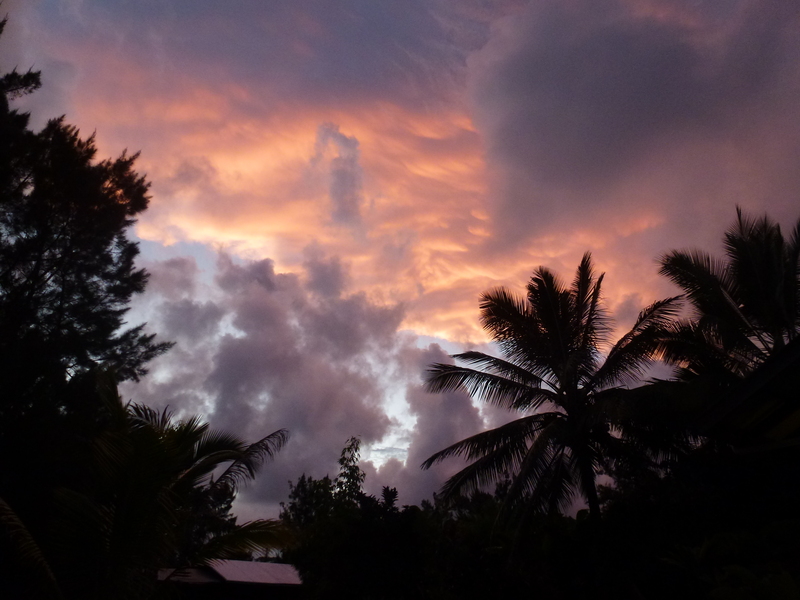 I was back home in Puna! Besides all this nesting that has, for the most part, been accomplished, I began socializing way more and way sooner than I had imagined I would. I went to the Palace Theater my second evening back for their annual production (this year, a splendid Little Shop of Horrors) and that’s where the surreal-ness showed up in the social arena. Within minutes, there were a dozen not only familiar faces, but hugs and ‘welcome back’s offered. Geez, I know people here. People seem to know me here. Isn’t this odd. Then it really amplified when I took up the invitation to attend part of the Puna Men’s Chorus retreat the next day. Now there were even more people greeting me with big hugs, Amy giving me a warm and sweet welcome and David asking me to contribute to the meeting’s discussion. So I did and it seemed I had something germane and even important to add to the mix. (Imagine that!) Had I ever really left? Was this just another meeting I was attending? Ohmy, here are more people I know, who know me. Here are people I even love and who love me. Here is an organization I care about, I have a history with. What the hell is going on? It seems I have a life here after all. A life that matters to me. I simply forgot that this was true. And now, in the midst of my homecoming, I am remembering. And it is this remembering and the sweet taste of it on my lips that has been the very best part of my return. And then there was the 3rd Annual Halloween party at David, Howard and Greg’s this past week-end. I jumped in and helped out a little bit and here again I stepped right back in to a social scene and community in which it seemed I had a place. I’ll go to the PMC Board Meeting as a guest tonight. I’ll join a chorus again when the next season begins after the new year. I’ve already joined the Improv Theater group that’s been formed at Kalani. I attended its first session last week and it was great fun; so even my new performance interests have an outlet here. 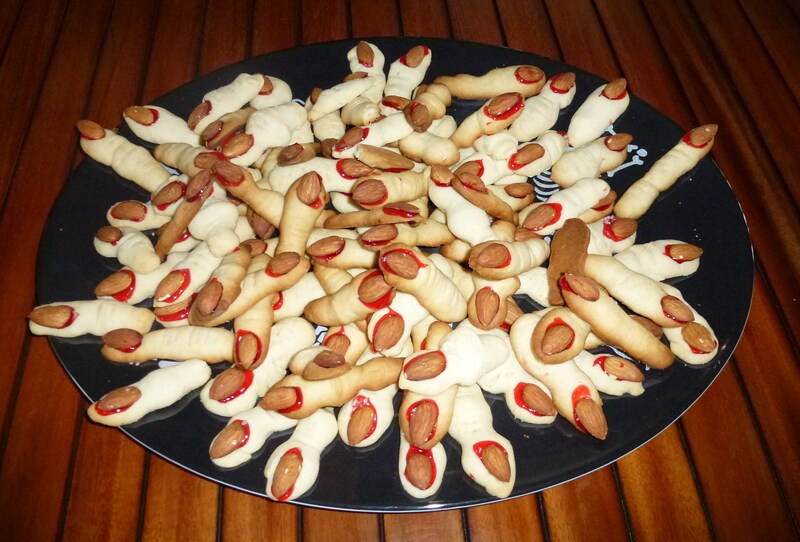 Tasty finger-lickin' treats from the Halloween party! Oh, Puna is still, well … Puna – quirky, way off more than only the electrical grid and filled with wacky, strange bedfellows, for sure. Nothing’s changed in those ways. But I have. I don’t need it to be what it isn’t. I don’t need it to give me what it doesn’t have to give. I’ve returned replete from the connections with my Bay Area beloveds; experiences and reflections providing me with more material than I can keep up with; and visions and plans that have me inspired and excited for the next steps of my life. And I have friends here with whom to share some of that. 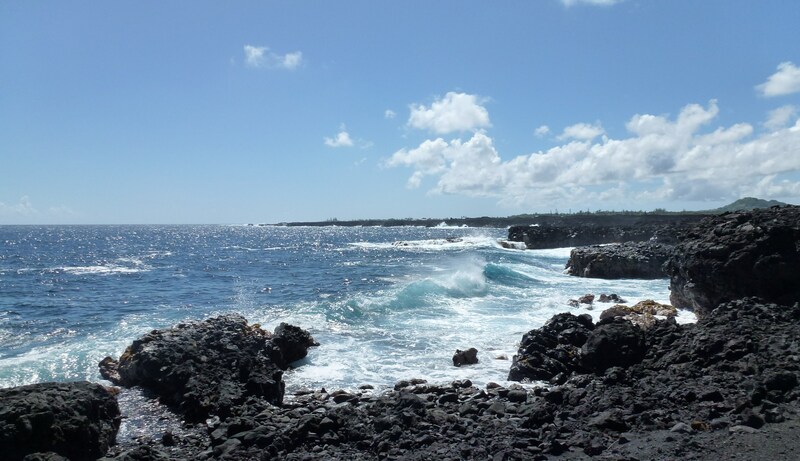 Puna is not the Bay Area and now with my renewed connection and commitment to staying plugged in there, the pressure is off Puna for it to be what it never can be. So now it gets to be what it is – ahhh, what a relief for us both. And as the backdrop for this next phase of my life, in this moment, I imagine that it will suit me just fine. I’m as surprised as I could be that this is my truth right now. I thought I would return here, stay through the holidays and then begin to get a hankering for moving right along. I imagined I’d be on my way soon after Singing with Courage in January. Where, I wasn’t sure, but I truly thought I’d be parting ways with Puna. And soon. Now I’m not so sure. What’s to come, I don’t know, I only know that in the short time since I’ve returned, something is already shifting. And I love that I’m meeting the truth of that and willing to shift from what I thought just a moment ago. I thought perhaps that Maui was calling. I went there directly from California because I thought perhaps it would be my next home. I arrived with eager and open eyes, ready to imagine my new life there. The beaches are sublime, there is no question about that. And yet the truth is, that the rest of Maui did not dazzle me. As I drove the strip of Kihei, with strip mall after endless strip mall, I thought I had landed in Florida. I was staggered by the prices at the gas pumps and the grocery check out lines. I was equally distraught at what seems to be the segregated communities – where were all the local people, the local culture, the Hawaiian energy? It’s there, I’m sure, but I couldn’t find it. 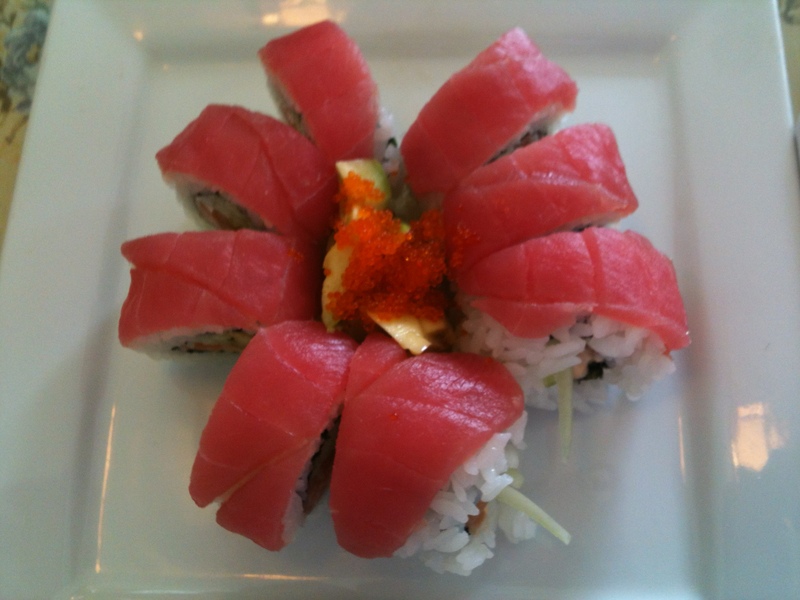 If I want to be in Marin County, well then, I’ll be in Marin County; but I would like the taste of Hawaii here in Hawaii. Maui didn’t give me that. My experience at Maui Sufi Camp was interesting, but not deeply resonant in the sense that that community would be an entre` for me to the island. So I left there without feeling called to call it home and yet certainly not closing any doors either. What my time there did give me was the opportunity to reflect upon what my next steps are; how I want to spend my time; and what is important to me now. And as I answered those questions, I came to the thought that Puna just might be the perfect backdrop to support those endeavors. Being back here makes those thoughts even more clear to me. I’m filled with a sense of renewed appreciation for this place. My heart feels full with the sense of connection I have with people here. I have a home that I love which is easily affordable on a no-income lifestyle. I have activities and a social life that I can engage with when I want to and the solitude I need to focus on my writings and workshop development. While there is not a swimming ocean nearby, the Warm Ponds soothe me as I float and play there. I can snorkel nearby in gorgeous clear waters. The truth is, that in every direction, East Hawaii, Puna Makai is breathtakingly stuunning. The nature is simply over-the-top. I can hike and still find unexplored new places. The sense of familiarity and comfort here is what will support me as I move in new directions. I love the large social circle I’ve created here and I love seeing people I know everywhere I go. I love the friendships I’ve cultivated over five years and those that are growing deeper and more firmly in my heart and my life. The holidays are my favorite time of year here and they’re coming soon, along with my sister. I love Hilo town, its funky charm, its filled with local flavor-ness, and its small but happening cultural and arts scene. I love eating fresh local ahi and picking avos almost the size of footballs from the trees outside my cabin. And I love my plan that Puna is my part-time home, my home away from the Bay Area, that is also my home. I love the silence that surrounds me here at home – no street noise, only the sounds of nature all around me – and I love that I’ve sat here for the better part of this day writing and writing and feeling totally supported in the process. I’ve often said that no one decides on their own whether they’re going to stay in or leave Puna. I’ve known people who’ve come and thought they’d be here forever and were gone in less than a year. I know others who have tried to leave, really tried to leave and simply couldn’t make their way off the island. And I know people who were born and raised here, and have generations of ‘ohana (family) before them; and they’ve spoken of the visceral sense of kuleana (responsibility) they feel toward staying connected to the aina (land) here that I, a person of European descent, cannot begin to really understand. I’m a person with my feet firmly on the ground – there’s not a lot of woo-woo in me – and yet I know that the statement I’m about to make can have that woo-woo kind of sound to it. The truth is that Madame Pelé has a much bigger voice in that process of deciding to stay or go than any of us may think or prefer. So while I thought I was done with Puna, it appears that Puna is not done with me. And as I’ve done since I’ve arrived on this island five years ago, I surrender to her forces and to her will; and I trust that she will guide me and lead me on a path worth taking. Last night's sunset - right in my backyard! Last night's crescent moon over my cabin. Welcome home, what a long wonderful journey you had. I look forward to seeing you in january. Thanks for this beautiful update, Christina dear. I’m so glad you’re at peace with where you are, and what a place to be!! Let’s talk soon, and start making plans for our visit in the new year. Thanks to you, too, dear one! Would love to talk soon and can’t wait to see all of you in a few months!! Yippeeeee!! !